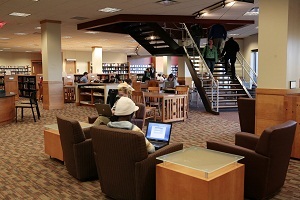 The Newark Campus Warner Library, located on the main floor of the John L. and Christine Warner Library and Student Center, serves the students, faculty and staff of Ohio State University at Newark as well as the students, faculty and staff of Central Ohio Technical College. As such, it delivers the full gamut of library resources and services including but not limited to reference service, library instruction, collaboration areas, interlibrary loan, reserves, laptop computers, and database access. 45,000 print volumes, 170 serial subscriptions, 1800 videos and DVDs, and 1,200 maps. As part of the Ohio State University library system and the OhioLINK consortium, the Library provides access to millions of books and other library materials, many research databases, millions of electronic journal articles, thousands of e-books, images, video and sounds, as well as thousands of theses and dissertations from Ohio students. 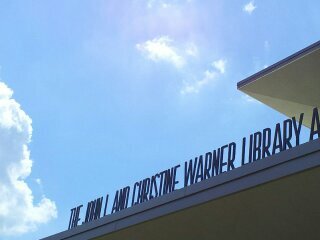 Welcome to the John L. and Christine Warner Library at the Newark Campus. Come sit by the fire and read a newspaper or magazine, study at a table or in a comfy chair or in our state-of-the-art classroom. Check out a laptop computer to use in our wireless environment, work in one of our study rooms, or meet together in spaces designed for group collaboration. Librarians and staff members are available to assist students, faculty and community members in their research and other library needs. Laptop Checkout Laptops can be checked out from the Library for 4 hours with a fine of $10 for every hour that it is overdue. Also available for use with the laptops are a/c wall chargers, mice, and headphones. All of which are checked out for 4 hours and have a $10 per hour fine for every hour they are overdue. The Newark Campus John L. & Christine Warner Library’s service values emphasize respectful human interaction and the stewardship and protection of human and information resources, as well as the system’s physical facilities. We ask users to support these values by demonstrating positive behaviors while using the library. This policy is created to comply with the Drug-Free School and Communities Act Amendments of 1989 (Public Law 101-226), which requires that the university/college show it has adopted and implemented a program to prevent the illicit use of drugs and the abuse of alcohol by faculty, staff, and students, and to set forth the standards to provide a community setting that is safe, healthy, and productive for all faculty, staff, and students of The Ohio State University at Newark and Central Ohio Technical College. The university/college distributes this policy annually throughout the university/college community and this includes information about referral and treatment, applicable laws and sanctions, and current assessments of possible health risks. Unlawful possession, use, production, distribution, or sale of alcohol or other drugs by any faculty, staff, or student is prohibited on university/college property or as any part of university/college activities. Holiday Closings may vary - please contact the library for specific dates. Student Library Assistant positions are advertised at Financial Aid 740-364-9364 in Hopewell Hall Rm. 135. Regular full and part time staff positions are advertised through Human Resources 740-364-9367 in Founders Hall room 1024. The Newark Campus Warner Library welcomes gifts and donations that support the teaching, research, and other academic needs of our students and researchers. Campus and community supporters continue to enrich the Library's holdings through generous donations of books and other materials.